Go to any nearby Panda Express Restaurant and print or show this coupon (above) on your mobile device and receive a FREE Samurai Surf and Turf. All the below listed locations will be participating! Remember DiabloReporter.com is available in a mobile format for easy use. 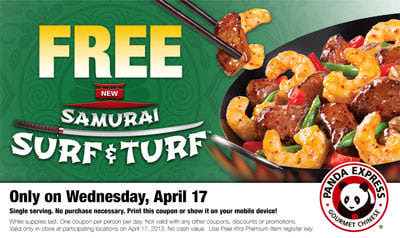 Enjoy and let us know what you think about your FREE Samurai Surf and Turf. This entry was posted in Antioch, Clayton, Lafayette, Walnut Creek. Bookmark the permalink. Awesome! Our company does Panda for lunch every Thursday. I’m looking forward to trying their Surf & Turf!